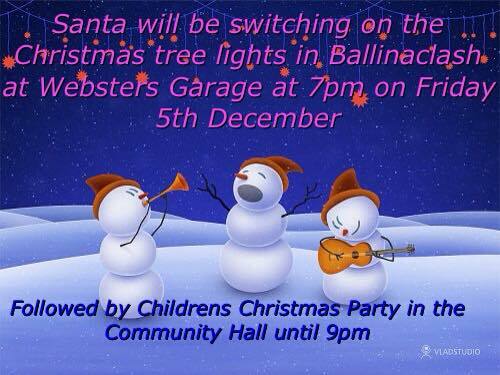 Ballinaclash Foroige Youth Club, as part of our citizenship project, invite you to our Christmas Tree Switch On at Websters Garage in Ballinaclash at 7 p.m this Friday night , 5 December, for some festive cheer and afterwards to the Community Hall (old school) for hot drinks and refreshments, children’s games and some one to one time with our special guest. Wrap up warm and join us for some carol singing, Christmas wishes and lighting countdown. We hope to get lots of community support.